Navigator, Pilot and First-generation IC: Only available as designed into existing equipment. The Magellan® Family of Motion Control ICs provides high-performance chip-based motion control for multiple motor types, such as Servo motors and drives. Available in 1, 2, 3, and 4-axis versions, these flexible, programmable multi-axis controllers work with Brushless DC controllers, stepper motors, and DC Brush motors. Magellan ICs are designed for demanding applications such as medical lab automation robotics, liquid handling, and other scientific instrumentation. 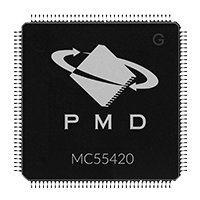 Magellan motion control IC chips can be used directly in your own control board designs, or via Performance Motion Device's module, digital drive, and motor control board products, where they form the motion control core of each of these devices. Our popular positioning motion control IC with motor current control for Brushless DC, DC Brush, and step motors in a compact single-axis motion controller package. A powerful positioning IC for Brushless DC, DC Brush, and step motors in a compact one- to 4 axis motion controller package. A positioning motion controller for step motors in a compact one- to 4 axis motion control system. Our Magellan® MC58113 Motion Control IC provides high-performance motion control with an integrated digital current loop for medical, scientific, robotic, and automation applications. Available as a single, one-axis IC, the MC58113 IC is a programmable device that provides positioning, velocity, and torque control for Brushless DC, step, and DC Brush motors. This versatile and powerful IC provides profile generation, servo-loop closure, commutation, and pulse and direction output along with direct quadrature encoder input. Advanced digital current control and amplifier switch signal generation technology deliver smooth, ultra-quiet operation – particularly useful for eliminating the noise associated with step motors. The Magellan® MC58000 Motion Control IC provides high-performance motion control for medical, scientific, robotic, and automation applications. Available in 1, 2, 3, and 4-axis versions, the MC58000 IC is a programmable device that provides position and velocity control for Brushless DC, step, and DC Brush motors. This flexible and powerful chipset provides profile generation, servo-loop closure, commutation, and pulse and direction output along with direct quadrature encoder input. 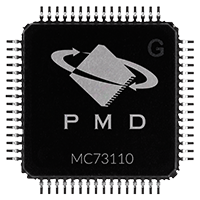 Motor command output is provided for PMD's Atlas Amplifier modules, on-card PWM (Pulse Width Modulation) IC amplifiers, or +/- 10V input amplifiers. The Magellan® MC55000 Motion Control IC provides high-performance motion control for medical, scientific, robotic, and automation applications. Available in 1, 2, 3, and 4-axis versions, this flexible, programmable device provides profile generation and pulse and direction output for step motor-based systems. The Juno® Family of ICs provide advanced velocity and torque control for brushless DC, DC brush, and step motors. They are the industry’s first family of compact ICs with full four-quadrant motion control, direct input quadrature encoder, profile generation, and advanced current control. Juno ICs are targeted for medical, scientific, industrial, and robotic applications that need to minimize motor noise, vibration, and power consumption. Juno ICs are easy to deploy with embedded motion commands, on-board intelligence, and direct analog and digital amplifier signal interfacing. Velocity Control ICs: Sophisticated velocity and torque control of 3-phase brushless DC, DC brush, step motors or multi-motor. Step Motor Control ICs: State of the art step motor control with pulse and direction or SPI command input. Torque Control ICs: Ultra-precise torque control for 3-phase Brushless DC and DC Brush motors with direct analog or SPI command input. No matter what your motor control application, there is a Juno IC that will take your application to a higher level. Get your motor running in hours, not days, with easy to use board and software packages. 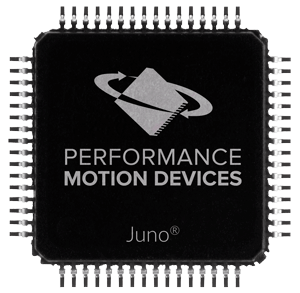 Juno Developer Kits enable concurrent software and hardware development. While your hardware team develops your board, your software team can develop the system controls on the Developer Kit board. While our Navigator®, Pilot®, and First Generation ICs are no longer available for new product development, we continue to supply and service these products for customers using them in existing equipment. For technical information about Navigator or Pilot ICs, please see our online resources. The MC73110 Velocity and Torque Control IC provides high-performance digital current loop, velocity loop, and commutation for Brushless DC motors. This intelligent single-axis drive controller operates in internal velocity profile mode, velocity mode with an external velocity command signal, or torque mode with an external torque signal in combination with the Magellan® MC58000 series ICs. Dedicated, IC-based device that provides programmable motion control. Depending on the type of motor controlled, they provide servo loop closure, on-board commutation for Brushless motors, and high-speed pulse and direction outputs.